I made this bread a few weeks ago and have forgotten to link to Little Thumbs Up event, ingredient for this month is Orange, and today is the last day for linking. I'm not late, not late, just on time! haha! These are little rolls, baked in a muffin pan. They look really puffy cute to me! Some of the ingredients used are pumpkin puree, orange zest and Grand Marnier. I've used my homemade pumpkin puree which I made a while back and kept them frozen in containers, really convenient to have some pumpkin puree around. The dough is easy to handle, soft but not at all sticky. They do not take long to rise, by the time I finished with the last one, the first few ones are already risen and puffy. Bake in a preheated oven at 400F, for 15 minutes until they are golden brown and the bottom sounds hollow when tapped with your finger. It looks cute and puffy, and I like the golden yellow colour of these rolls. Texture is soft, not the kind of fluffy soft, but they are soft. The taste of the orange really shines through, though it is a little too orangey for me! Haha! Maybe with a little bit less of Grand Marnier would be less orangey in taste. These are nice when eaten warm with some salted butter, and the next day, they are good dunked in coffee! Pour the warm water in a small bowl. Sprinkle the yeast and pinch of brown sugar over the surface of the water. Stir to dissolve and let stand at room temperature until foamy, about 10 minutes. In a large bowl using a whisk or in the work bowl of a heavy-duty electric mixer fitted with the paddle attachments, combine the milk, liqueur, squash, brown sugar, orange zest, salt, and butter. Add the yeast mixture and 2 cups of the flour. Beat until smooth and creamy, about 2 minutes. Gradually add the remaining flour, 1/2 cup at a time, until a soft dough that just clears the sides of the bowl is formed. Switch to a wooden spoon when necessary if mixing by hand. Turn the dough out onto a lightly floured work surface and knead until satiny and elastic, about 4 minutes, dusting with flour only 1 tablespoon at a time as needed to prevent sticking. This should be a very smooth dough. If kneading by machine, switch from the paddle to the dough hook and knead for 3 to 4 minutes, or until the dough is smooth and springy and springs back when pressed. If desired, transfer the dough to a floured surface and knead briefly by hand. Place the dough in a greased deep container. Turn once to coat the top and cover with plastic wrap. Let rise at room temperature until doubled in bulk, about 1 hour. Gently deflate the dough. Turn the dough out onto the lightly floured work surface. Lightly grease twelve 1-5/8-inch round muffin cups. Divide the dough into 4 equal portions. Divide each of these portions into 3 equal portions, and shape these into small balls about the size of a walnut (about 1 inch in diameter). Arrange 3 balls of dough in each of the muffin cups. Cover loosely with plastic wrap and let rise until doubled in bulk, about 20 minutes. Twenty minutes before baking, preheat the oven to 400F. Place the muffin tins on a rack in the center of the oven and bake for 12 to 15 minutes, or until golden brown and the rolls sound hollow when tapped with your finger. Remove the rolls immediately from the muffin tins and transfer to cooling racks. Serve them warm. 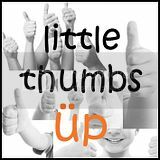 This post is linked to the event, Little Thumbs up organised by Bake For Happy Kids, and My Little Favourite DIY, hosted by Ann of Anncoo Journal . 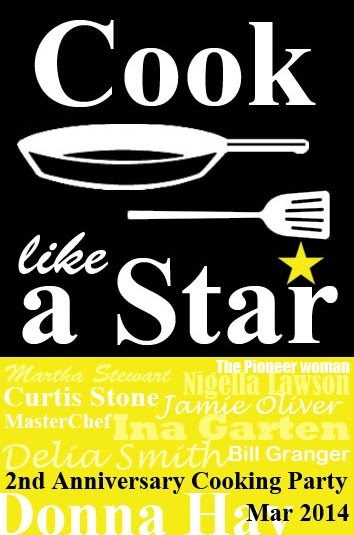 This will be my last post for Cook Like A Star : All Stars Anniversary March/April 2014. There are so far 130 links (will update later) and I would like to thank each and every one who has joined in our Anniversary Party. It would not be a party without you gals! I hope that you had fun cooking and baking for our All Stars Anniversary Party, I sure did! Thank you for all your delicious links and your wonderful support! There's still today and tomorrow to submit your posts, keep them coming! While I was "rummaging" thru my pantry, found a can of peach halves which I bought for this recipe months ago, but have completely forgotten all about it. This hand pies was originally Apricot Hand Pies from Martha Stewart's New Pies and Tarts cookbook, and the recipe uses fresh apricots which are simmered with some cardamom, sugar, lemon peel and vanilla, and left to cool. Fresh apricots are really expensive and is not easy to find, as they are imported and depend on the season's availability. Now getting canned apricots is not easy too, I have bought canned apricots only once before, and that was ages ago, and have not seen it it since. On the other hand, we can get canned peaches easily, as we can buy them from any supermarkets. Instead of simmering fresh apricots, I have skipped all that process and used the canned peach halves instead. Drain the canned peach halves and dab with kitchen paper towel to get rid of excess moisture. Firstly, make the pastry, Pate Brisee, and it needs to be refrigerated for at least 30 minutes to firm up. The recipe states to use about 1/4 to 1/2 cup of ice cold water, and I started off with 1/4 cup, which is a little too much. The next time, I'll start with 2 tablespoons instead and add on as necessary. As the pastry was quite soft and sticky, though with some sprinkling of flour helps. Roll out half of the firm dough and use a 3" cookie cutter to make some rounds. Refrigerate these rounds, and with the other half of the remaining dough, use a 4" cookie cutter to make equal number of rounds, these need not be refrigerated. Remove the tray with the 3" rounds from the refrigerator, place a piece of half apricot or peaches, cut side down, brush the sides of the pastry all around with some water and place the 4" round over, press the pastry edges together to seal. I use a fork to tine the edges. Refrigerate for 30 minutes. Use a sharp knife to make a cross on the top, brush the pastry with some water and sprinkle some sanding sugar over the top. I have used demerara sugar. I made only 8 as there was only 8 half pieces of peaches in the can. There was some pastry left, though I don't think that it is enough to make another 4, as the recipes states that it would yield 12 hand pies. Bake in a preheated oven at 425F for 15 minutes, reduce heat to 350F and bake for a further 15 to 20 minutes, until pastry is golden brown. Transfer to a wire rack to cool. I made the hand pies in the afternoon, with a pot of warm tea, and we enjoyed these hand pies while still warm, and they are really nice. The pastry is flaky and buttery, and while I guess that with fresh apricots simmered in cardamom, lemon and vanilla would be more flavourful, the canned peaches makes a nice substitute. Bring the water, granulates sugar, lemon peel, ginger, cardamom, and vanilla-bean seeds to a boil in a saucepan. Cook until sugar dissolves; reduce heat, and simmer, uncovered, until liquid has thickened slightly, about 10 minutes. Add apricots to pan. Rinse a double thickness of cheesecloth under cold water, and drape over apricots so fruit is covered by cloth and submerged in liquid. (Alternatively, cut a round of parchment to fit pan and cover fruit). Continue simmering until apricots soften slightly, 2 to 4 minutes, depending on the ripeness. Remove from heat, and let cool completely. Use immediately, or transfer apricots and poaching liquid to a storage container. Make sure apricots are completely submerged in liquid at all times. Refrigerate until ready to use, up to 4 days. On a lightly floured surface, roll out disk of dough into a large round, about 1/8 inch thick. Cut out twelve 3-inch rounds. Transfer rounds to a parchment-lined rimmed baking sheet; refrigerate or freeze until firm, about 30 minutes. Repeat process with remaining dough, using a 4-inch cookie cutter to make 12 more rounds; do not refrigerate. Using paper towels, blot poached apricots halves to eliminate excess liquid. Place 1 in center of each chilled 3-inch round. Brush ice water around edges of dough; cover each with an unchilled 4-inch round. Gently press edges together to seal. Refrigerate about 30 minutes. Preheat oven to 425F. Using a paring knife, slash top of each hand pie in a crosshatch fashion. Brush with water, and generously sprinkle with sanding sugar. Bake for 15 minutes. Reduce heat to 350F. Continue baking until pastry is golden brown, 15 to 20 minutes more. Transfer pies to a wire rack to cool slightly before serving. Or let cool completely, and store in an airtight container at room temperature up to 4 days. Pulse flour, salt, and sugar in a food processor (or whisk together by hand in a bowl). Add butter, and pulse (or quickly cut in with a pastry blender or your fingertips) until mixture resembles coarse meal, with some larger pieces remaining. Drizzle 1/4 cup water over mixture. Pulse (or mix with a fork) until mixture just begins to hold together. If dough is too dry, add 1/4 cup more water, 1 tablespoon at a time, and pulse (or mix with a fork). Divide dough in half onto two pieces of plastic wrap. Gather into two balls, wrap loosely in plastic, and press each into a disk using a rolling pin. Refrigerate until firm, well wrapped in plastic, 1 hour or up to 1 day. (Dough can be frozen up to 3 months; thaw in refrigerator before using). The next Cook Like A Star featuring Paula Deen and The Deen Brothers will be in June 2014, and the hosts are Zoe of Bake For Happy Kids, Diana of Domestic Goddess Wannabe and Joyce of Kitchen Flavours. Everyone is welcome to join us. Cook or bake any recipes from the featured chefs and link your posts to the linky at any of the hosts' page on June 1st right up to 30th June. I have lots of dried fruits in my baking pantry, which I am trying to clear. Found two unopened packs of dried cranberries, I must have forgotten that I already have a pack when I bought the second one! Note to self : do not buy anymore dried fruits until I have finished the ones I have right now, golden raisins, black raisins, prunes, apricots, black currant, cranberries! Those are only dried fruits, there are nuts, various types of flour and other knick knacks! Much as I like my pantry to be cleared as much as possible, I really do like a well-stocked pantry. Do you buy your ingredients only when needed and enough for that one bake? Or like me, can't help myself when it comes to baking ingredients and then months later, got to find recipes to clear them off! Haha! Much as I'm always trying to clear my pantry, I have never succeeded before, and I don't think I ever will! wink! The first thing that came to mind with these dried fruits are bars or slices. And found a really nice recipe from this lovely book, which I have been neglecting for a while now, "Bake Something Great", which has 400 bars, squares and cookies recipes, by Jill Snider. Wonderful thing is, it uses three types of dried fruits, and what a coincidence, I have all three (ha!ha!, really!). Big grin!! These Cranberry Orange Apricot Bars has a buttery crust at the bottom, with a fruity-nut layer on the top. The crust is really easy and quick to make, it is a mixture of flour, brown sugar and butter, which are processed until crumbly and then spread in the baking pan to a thin layer. It is then baked about 10 to 12 minutes until the sides are a little brown. It took mine about 15 minutes, maybe because I lined the pan with baking parchment extending over two opposite sides, for easy removal of the whole bars for easy cutting later. To prepare the top layer, the dried fruits are chopped and bring to boil with some freshly squeezed orange juice in a saucepan over medium heat. Remove from heat and let stand for 20 minutes. Drain off any excess liquid. Whisk eggs and brown sugar in a medium bowl until blended, add the flour and cinnamon and stir until combined. Pecans and the boiled dried fruits are stirred in, spread mixture over the baked crust. Return to oven and baked until the top layer is golden brown and set, about 25 to 30 minutes. Let cool completely in pan. Remove the whole bar by lifting the two ends of the baking parchment, cut into bars to serve. My notes : This is a lovely bar, with buttery crust and fruity-nutty topping. I have reduced the sugar for both the crust and the topping, and believe me, you would not miss out on the sugar. Even with the reduced amount of sugar, I can definitely taste the sweetness of these bars, which comes from the dried fruits. Really nice to snack on, and wonderful with a cup of warm tea. Crust : In a bowl, combine flour and brown sugar. Using a pastry blender, 2 knives or your fingers, cut in butter until mixture resembles coarse crumbs. Press evenly into prepared pan. Bake in preheated oven until golden around the edges, 10 to 12 minutes. Filling : In a saucepan, combine raisins, cranberries, apricots and orange juice. Bring to a boil over medium heat. Remove from heat and let stand for 20 minutes. Liquid should be absorbed. If necessary, drain off any excess. In a bowl, whisk eggs and brown sugar until blended. Add flour and cinnamon, whisking until smooth. Stir in pecans and fruit mixture. Spread evenly over crust. Return to oven and bake until top is set and golden, 25 to 30 minutes. Let cool completely in pan on rack. Cut into bars. It was one of those afternoons that I really have no idea on what to prepare for lunch, and remembered that I have bookmarked a potato recipe from The Pioneer Woman's website, which she called "Best Breakfast Potatoes Ever", recipe with such a name, makes me curious about the "best...ever"! Besides it looks really good on her website, but then her food always looks good! So a short trip to the nearby supermarket to get some bell peppers and potatoes. The good thing about this dish is once everything is cut and sliced, it all went into the oven, easy peasy! The recipe makes a huge amount, so I have made about half a recipe. I have used russet potatoes instead of red potatoes, and russet is a good choice, as they are perfect for roasting. For the bell peppers, I have used only two, one each of yellow and red. I have used 2 whole yellow onions, as we love onions and their sweet flavours really shines thru when roasted. And I have added in some garlic powder as well. Mix all ingredients together, seasoned with some salt and pepper. Place them on a baking sheet which I have lined with foil, for easier clean-up. Advisable to grease the foil with some olive oil, as the potatoes would stick. Bake for 25 minutes at 425F, turning once, increase heat to 500F, and bake until brown and crisp, about 15 to 20 minutes more. I moved the tray up to a higher level, to brown them more. Serve the potatoes while they are still hot. I served these potatoes with some sausages and Eggs Over Easy. Delicious lunch indeed, and these breakfast potatoes would make a great side dish. I would not call it the "best...ever", but it certainly is really delicious! Raise the heat to 500 degrees and bake until crisp and brown, 15 to 20 minutes, shaking the pan twice. "What's In Your Picnic Basket? 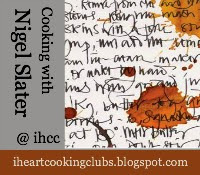 ", is our theme for this week at I Heart Cooking Clubs (IHCC), where we are currently cooking from Nigel Slater's recipes. I love picnics, do you? When I was looking thru his cookbooks, there are so many recipes that are great for picnics, after changing my mind a couple of times, I finally settled for Roast Chicken Wings with Lemon and Cracked Pepper. I have a dozen chicken wings in my freezer and always have a lemon or two around. Peppers and lemon are two of my favourite ingredients, and these chicken wings sounds perfect for a picnic. These chicken wings are so easy to make. Firstly some black peppercorns are bashed in a mortar until cracked to small pieces, not ground. Then the cracked peppercorns are mixed with some olive oil, and toss with the chicken wings, with lemon juice and salt. Recipe actually calls for some salt flakes scattered over the chicken, but I have used fine sea salt, mixing it into the other ingredients. The lemon shell is then cut up and tuck them in between the chicken wings with some bay leaves. The chicken wings are then roasted for 40-45 minutes, turning a couple of times in between until they are golden brown and cooked, though they are not as sticky as the recipe states. Simple, and delicious! Love the cracked black peppers and lemon, yummy! My picnic basket is ready, with lots of wet napkins to wipe your hands after! And I'm looking forward to see what everyone else is bringing in their picnic basket. Set the oven at 200C/Gas 6. Check the chicken wings for stray feathers - they seem to be more prevalent on the wings than on any other part of the bird. Put the wings into a roasting dish, halve the lemon and squeeze it over them, then cut up the lemon shells and tuck them, together with the bay leaves, between the chicken pieces. Put the peppercorns in a mortar and bash them so they crack into small pieces. They should still be knubbly, like small pieces of grit rather than finely ground. Mix the peppercorns with the olive oil, then toss with the chicken and lemon. Scatter the salt flakes,without crushing them, over the chicken. Roast for 40-45 minutes, turning once. The chicken should be golden and sticky, the edges blackened here and there. Enough for 2. To see what everyone is bringing in their Picnic Basket, please visit IHCC. The Home Bakers (THB), bake no. 34 is Chocolate-Almond Souffle Cake, selected by Grace of Life Can Be Simple. The original recipe recommended to use premium bittersweet chocolate such as Guittard or Sharffen Berger, and I do not have either one. What I do have, is a pack of semi-sweet chocolate which I wanted to use initially, but changed my mind when I found a container of chocolate sprinkles in my pantry. I know, it is not the same as chopped chocolate, but I do not like the idea of processing the chocolate in the food processor in our hot weather, I just knew that they would melt in no time! So by using chocolate sprinkles, I need not use and wash my food processor. Lazy me! I think the author would disapprove in my using chocolate sprinkles! Haha! I've made half a recipe and made some changes. Firstly, as usual, I've reduced the brown sugar slightly, by using only scant loosely packed half cup. And instead of processing the almond until finely ground, I have used ground almond instead. There are no oil or butter used in this cake, and I was keeping my fingers crossed that it would not turn out dry, as I hate dry cakes, nobody does! The eggs are separated and the whites are beaten until stiff and glossy. I have forgotten to add in the sugar when beating the egg whites! Oops...! The yolks are beaten until pale and creamy. Sugar, vanilla and almond extract are added in and beaten until pale and thick. Stir in half of the flour-grated chocolate mixture, then a third of the egg whites, the rest of the flour mixture and the rest of the egg whites. Spread in a greased springform pan, for half a recipe, I've used a 7" pan. I sprinkled some chocolate sprinkles over the batter, and bake in a preheated oven at 350F for 35 minutes. My notes : Cake is light with tender crumbs. Surprisingly it is not dry at all. It do not have a very moist texture like some cakes do, but it is not dry either. Really nice, seeing that this is a souffle cake and does not contain any butter or oil, so you don't have to feel guilty for the second slice. The chocolate sprinkles adds a nice chocolaty taste, though it would most certainly be better if grated good-quality chocolate is used. And the flavours of the cake actually improves overnight. This is just the kind of cake that is perfect with a cup of tea. For the full recipe and instructions, please visit the host of this bake, Grace of Life Can Be Simple To view other members' bake, please visit The Home Bakers (THB). We are a group of home bakers who are currently baking from "Coffee Cakes" by Lou Seibert Pappas, until each recipe from this book has been baked. This is our bake no. 34 and we have 26 recipes more to go. If you are interested to be a member and join in our bakes, you may drop me an email at kitchenflavours@yahoo.com. This is one of those simple "everyday" dish, that is great with some Jasmine rice. Really easy, quick and delicious. I made this dish a couple of weeks ago using frozen roasted pork. You may however used freshly bought roasted pork belly. Since mine was frozen, I thawed it overnight in the refrigerator, pan-fry the whole piece with a teaspoon of oil in a saucepan on both sides over low heat until the meat is heated thru and skin is crispy. Remove, drain, let cool and cut to thin slices. Long beans which are cut into 2" sections, are first sauteed in a little oil until cooked but still crunchy, with some black marks appear in some pieces, about 4-5 minutes. They are removed to a plate and proceed with the cooking of the sauce, and toss everything together to combine together with the roasted pork. The brand of black pepper sauce I used is Lee Kum Kee. Different brands may differ in terms of the spiciness and saltiness, adjust according to your taste. A simple and tasty dish, great with rice. Heat 1 tbsp oil in wok. Stir-fry long beans over high heat for 4-5 minutes until cooked but still crunchy, some black spots may appear in some pieces. Remove to a plate. Add the remaining 1 tbsp oil in wok. When oil is hot, add in the minced garlic and saute until light brown and fragrant. Pour in the sauce mixture, letting it come to a boil for a minute or two until sauce has reduced to about 3/4. Add in the long beans and chillies, stir for half a minute and lastly, add in the roasted pork slices. Stir for half a minute more and dish out to a serving plate. Serve hot with rice. 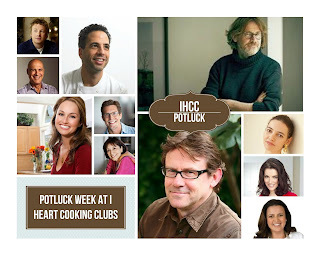 It's "Potluck Week" at I Heart Cooking Clubs (IHCC). It's our third week of cooking with Nigel Slater. For Potluck Week, we have the option of cooking from any of our previous featured chefs recipes, but I've decided to use one of his recipes for this week's Potluck. I've made "A Really Good Spaghetti Bolognese" a couple of weekends ago, for dinner, when the family requested for pasta. This recipe can be found from his book "The Kitchen Diaries", page 21, entered on January 17. What drawn me to his recipe is that he uses full-cream milk or cream for his Bolognese. And I was wondering the taste of cream in a Bolognese recipe, as the traditional recipe do not use any cream or milk. That led me to google for info on "Traditional Bolognese Recipe", and found an interesting article here. I have made some minor changes to the ingredients, using what I have, which are really just minor changes. The changes I've made are, to replace the pancetta with bacon, ground pork instead of lamb or beef. The sauce is cooked as per the recipe instructions below and simmered for about 1-1/2 hours, stirring occasionally, and checking the liquid level so that the sauce do not dry out. Then the milk or cream is poured in a bit at a time, and continue to cook for another 20 minutes. My notes : Before I added in the cooking cream, I tasted a spoonful of the sauce, it tastes really nice. I then added in about a quarter of the cream, and tasted again, it is nice. Then another quarter of the cream goes in, tasted again, I like it better with lesser cream and better still with no cream! So I stopped at only 100ml of the cream. Overall, this is a very tasty bolognese, though to me, it is not "A Really Good Spaghetti Bolognese" as the name of the recipe. (My favourite is still Jamie Oliver's, which I have posted here). That being said, the family did enjoy this pasta meal, I would not mind cooking this again, and would probably omit the cream. Melt the butter in a heavy-based pan. I use a cast-iron one about 24cm in diameter - then stir in the pancetta and let it cook for five minutes or so, without colouring much. Meanwhile peel and finely chop the onion and garlic and stir them into the pancetta. Scrub and finely chop the carrot and celery and stir them in, too. Lastly, finely chop the mushrooms and add to the pan, then tuck in the bay leaves and leave to cook for ten minutes over a moderate heat, stirring frequently. Turn up the heat and tip in the meat, breaking it up well with a fork. Now leave to cook without stirring for a good three or four minutes then, as the meat on the bottom is starting to brown, stir again, breaking up the meat where necessary, and leave to colour. Mix in the tomatoes, red wine, stock, a grating of nutmeg and some salt and black pepper, letting it come to the boil. Turn the heat down so that everything barely bubbles. There should be movement, but one that is gentle, not quite a simmer. Partially cover the pan with a lid and leave to putter away for an hour to an hour and a half, stirring from time to time and checking the liquid levels. You don't want it to be dry. Pour in the milk or cream a bit at a time, stir and continue cooking for twenty minutes. Check the seasoning, then serve with the pasta and grated Parmesan. To view what everyone is bringing for this week's Potluck, please visit IHCC. These cinnamon bread sticks are so easy to make. The dough needs only one rising, and you can enjoy these in less than two hours. Make it in the early afternoon, and by tea-time, you'll have these Cinnamons Sticks to enjoy with a cup of warm tea. The risen dough is rolled out and divided into four equal sections. Brush the top with some oil, (I used canola), and scatter with half the mixture of demerara sugar and cinnamon, pressing the mixture down lightly. Then place the dough onto a baking sheet with the cinnamon-sugar mixture facing down. Repeat with the top, brushing with oil and scatter with the balance half of the cinnamon-sugar mixture. Using a dough scraper, divide each piece into 3 pieces, totalling 12 pieces. You may need to adjust the positions of the pieces on the baking tray, spacing them a little. Bake in a preheated oven for 12-15 minutes, (mine took about 18 minutes), until golden. Transfer the baked Cinnamon Sticks to a wire rack to cool slightly. There's a chocolate sauce in the recipe, but I have opted an easy way out of using some leftover chocolate syrup instead... I was lazy and I do not like to melt chocolate, I hate to do the cleaning up! Good old Nutella to the rescue! What a difference it made! The breadstick are yummy with Nutella! Back into the fridge the chocolate syrup went! We ate the rest of the bread sticks with Nutella. These bread sticks are best eaten while still warm, while they are soft. They get a little stale when they have cooled down. If you are making these, either make the chocolate sauce, or use Nutella instead! Put the flour, yeast, sugar and salt into a bowl, stir to combine. Make a well in the center, then pour in 200ml/7fl oz of tepid water and stir to form a soft dough. Tip out on to a lightly floured work surface and knead for 10 minutes. Place in an oiled bowl, cover with a cloth and set aside for 1 hour, or until doubled in size. Preheat the oven to 200C/400F/Gas6 and lightly grease an oven tray. Combine the demerara sugar and cinnamon. Place the dough on a lightly floured surface and stretch it out to about 20cm x 20cm. Brush it with oil then scatter with half the sugar-and-cinnamon mix, pushing the mixture down lightly, then place the dough sugared-side down on the prepared oven tray. Brush with oil and top with the remaining sugar-and-cinnamon mix and cut into 12 lengths. Separate the sticks slightly and bake for 12 to 15 minutes, until cooked through and crisp. Transfer to a wire rack. For the chocolate sauce, put all the ingredients in a small pan over a very low heat. Stir occasionally, until the chocolate has melted. Stir in a pinch of salt. Serve the warm bread sticks with the chocolate sauce on the side. Our weather is much cooler with rain almost everyday, and the days are not as hot and humid, like we had for the past few months. Even with the cooler weather, it did not stop us from craving for cold desserts. I made this Cranberry Mulberry Orange Sorbet and we had this at 10pm a couple of nights ago when it was raining cats and dogs, with thunder and lightning for company! This sorbet has a vibrant deep beautiful colour of red, from both the cranberries and mulberries. The original recipe uses 1-1/2 cups of cranberries, without any mulberries, but I do not have enough of cranberries in my freezer, so I used a mixture of cranberries and mulberries. The cranberries, mulberries, orange zest, sugar and water are boiled for a minute or two. Remove saucepan from heat, cover and let rest for 30 minutes. At the end of 30 minutes, process the cranberries-mulberries mixture in a blender and strain over a sieve into a measuring jug or large bowl. Discard the skins or residue collected in the strainer. Pour the orange juice into the berries liquid, and stir to combine. Add 1 to 2 teaspoons of Grand Marnier (optional). Cover with cling wrap and refrigerate in the fridge until really cold, preferably overnight. The next day, churn the mixture in your ice cream maker according to the manufacturer's instructions. Sorbet is not really thick, but it has an icy-crystal texture. Scoop into a container and freeze. After overnight in the freezer. Beautiful vibrant colour from the berries! Really refreshing and yummy! Especially good, after a meal at dinnertime. It is so refreshing and berrylicious! If you do not have an ice cream maker, make this into granita instead. Either sorbet or granita, these are wonderfully berry-refreshing! Heat the cranberries, (mulberries), water, sugar and zest in a medium, non-reactive saucepan until the liquid begins to boil. Boil for 1 minute, then remove from the heat, cover, and let stand for 30 minutes. Pass the cranberries and their liquid through a food mill fitted with a fine disk, or puree them in a blender or food processor and then press the puree through a sieve to remove any large bits of cranberry skin. Stir in the orange juice and the liqueur, if using.